The short 11th at Tasmania GC. Into the wind every time. The 2018 MM got off to a slow and wet start, with defending champ Basil struggling to find anyone brave enough to play him, Leroy pinging a hammy, and then a huge storm knocking out Kingston Beach Golf Course for a month or two – which meant that three time Champ Felix stayed in the sheds til June. It also saw the introduction of the new Fairness in Handicapping initiative, which will allow for greater competitiveness from the high handicappers, and hopefully see them snagging their first Majors soon. The Defending Champ was seen as too fearsome to play, so it took a while to get someone brave enough to take him on! He kicked off his title defence at Tasmania GC in early May against Cravo. Bas was not dealt any favours by the MM Index in that match or his next one against Tim J, and ultimately fell in both battles. From a 0-2 start he needed some wins in a hurry! Being on the wrong end of all the bounces in his match v Leroy did not help – another loss. His next mission, beat Felix. Which he did! In a tough contest at Geevo. Next potential victim, Ian. And Basil was back to his best, playing under his handicap and dispatching Ian to finish with 2 wins in his last 2 matches. The 3 time winner was looking for a 5th straight appearance in the Final this year, and he looked to kick off with the traditional Leroy battle over Kingston Beach’s hardest holes – but was delayed by the biggest storm in 40 years flooding the course. A 2up last hole win v Leroy courtesy of an overhit putt that found the middle of the cup was a traditional nailbiting start. Fell to Cravo at his nemesis course, Llanherne, to go 1 from 2. Then he shot his best ever score at Tea Tree, taking down Ian and Tim J in the process to go 3 from 4 and looking good for his 5th Final in a row. Played nicely if a little loose in his match v Basil but had some bad luck, which added up to a loss. Finished with a 3 from 5 record, sames as Leroy so assured of a playoff for the Final. While waiting for the Cravo v Ian match, Felix and Leroy played a draw (with possibly useful playoff hole). Then Cravo lost to Ian and Felix and Cravo played a draw, putting Felix in the box seat for this fifth final in a row. Complicated! But good. Until the good Gent realised he had overstated his handicap by one shot, meaning that the playoff v Cravo was now a narrow loss and he missed the Final by a whisker. Outstanding sportsmanship from our favourite golfer and Greatest Matchplay exponent. Like many other Gents, Cravo’s best MM finish is as a losing finalist and this year he was determined to go one better. He knocked Bas over at Tasmania GC to start with, and lost one of his bunny tags! A sleep deprived win vs Tim J was immediately followed by a narrow loss to Leroy on the back nine, leaving him at 2 from 3, so right in the mix. A win vs his nemesis Felix was a great result, going 3 from 4 and taking the lead in the tournament. It took a couple of months to schedule Ian in for the last match. He thought about it waaaay too much in the interim, and did not have a good headspace for the match when it rolled around. Ian was way too good anyway. And then he drew with Felix in their playoff, but this was later revised to a 1up win, sending Cravo to the Final. Once he got out of rehab for a hammy strain, Leroy got going against Tim J at NWB. Some huge bomb putts (30ft, 20ft) from Leroy slammed the door shut on poor Tim, with a 3&2 win. Two classic battles at Tasmania (last hole loss to Ian, last hole win v Cravo) was great golf and showcased what the MM is all about. Another last hole contest for Leroy at Kingston v Felix, this one a loss, meaning he needed more wins. He knocked over Basil at St Helens next up, leaving him 3 from 5 and possibly done for his Round Robins, needing to wait a couple months for other results to see if he makes the Final. Turned out that was good enough to make a playoff for the Final, where he was AS with Felix after 9, and took it out on the 10th hole in sudden death. Then Cravo lost to Ian and that meant another playoff. Until Felix’s handicap review put Leroy directly into the Final. Always hard to get him out on the course, but once there, look out! Fresh off his first Major win in five years, expectations were high. He kicked off with a couple of MMs at Tasmania GC in May, with two last hole nailbiters – win vs Leroy and a half with Tim J – a great start. Played amazing at Tea Tree, but Felix was even more amazing, and he found himself at 1.5 from 3, so still with his destiny in his own hands, but not much room for error. Unfortunately he fell at the Basil hurdle, meaning that his last match v Cravo was for world rankings points only (but with a chance to get some revenge on Bas by leapfrogging him in the final standings). Ian smashed Cravo with brilliant golf at Pittwater to leapfrog Basil and claim some rankings points, and a result for POTY. Tim got bit by the golf bug and joined the Gents Tour just in time for the MM. But make no mistake, he is here to do some damage and win some trophies! And he started like he meant it, knocking over the World Number One and Greatest of All Time, Basil, at soggy NWB. Next up he ran into Leroy and his white hot flat stick at NWB, and could not prevail. He upped the ante and bravely ventured to Tasmania GC, falling to Cravo and holing a clutch 2m putt on the last hole for a half with Ian to be 1.5 from 4. Got towelled up by a rampaging Felix at Tea Tree to be 1.5 from 5, but showed plenty and will be a threat in future years. No campaigns this time – the MM was almost wrapped in June and the boys hadn’t got out yet. Gaz played some brilliant golf socially. Darvy perhaps needs some Tiger woods spinal fusion to resume his nascent career. Matt sounds quite busy with work, a new house and small ones. 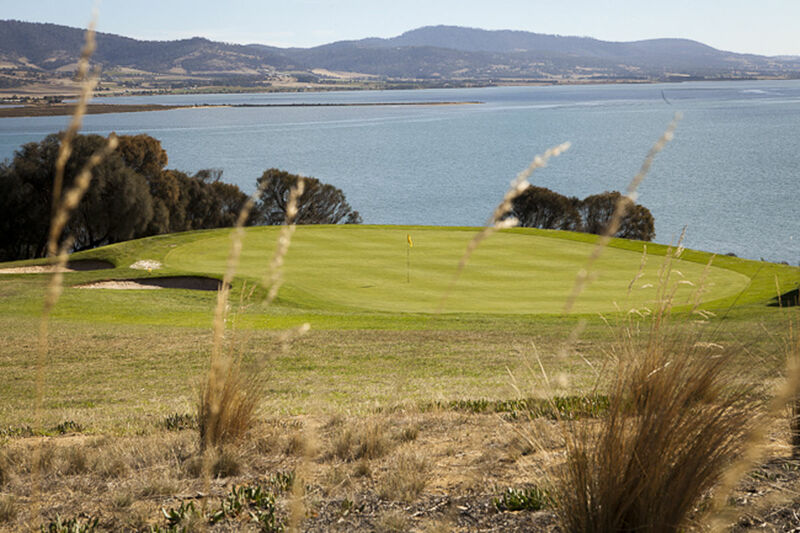 The first match of the 2018 MM just went down on Sunday 6th May : defending Champ Basil vs Cravo at windy Tasmania GC. Bas and Cravo hadn’t played for 3 weeks, so used the front nine as a warm up. Both had 14 SFord points. MM started on the 10th. Cravo very lucky with the Matchplay index – with an extra shot on the shorty par 3 and all the par 5s. Bas will probably need to smash him on the par 4s. Bas under pressure has to go at the sucker pin with a low 9 iron into the wind. Comes out a bit skinny and bounces over the green. Cravo slightly fats his 9 iron and finds the bunker. Cravo out nicely to about 3m. Bas has rotten luck – his ball is buried waaaay down in the rough and he can only hack it out to the fringe of the green. Needs to hole his chip but it doesn’t fall. Cravo bogeys and goes 1 up. Bas lovely low draw down the R middle, which just bounces into the rough. Cravo tails one into the R trees. Knocks a 52 over, then hits wedge on. Bas can’t quite connect his 2nd from the rough, and his chip from 60m is also on the green and a bit inside Cravo’s. Cravo nice birdie try and tap in par. Bas nice birdie try and tap in par – which means Cravo wins the hole. Cravo 3 up. Bas hits a great drive down the middle. Cravo draws one into the trees L, but it drops nicely to the rough near the fairway. Squirts a 3 iron down to the 150 mark, and Basil draws his wood into the trees L. “Go on – bounce in there!” Basil says. Cravo hits a poor 5 iron which fades and finishes on a tight lie, leaving a tricky chip back across the bunker. Bas hits a power draw which the hill knocks down. Bas chips on, Cravo chips closer. Basil’s par doesn’t drop so Cravo can win the match with a 3 putt. Takes 2. Cravo wins 4&2. Thanks for a fun match Bas – if a few putts went the other way it would’ve been tight. Given reigning champion Basil’s opening loss to Cravo, he was keen for a win. And with the insanely optimistic handicap newcomer Tim received from the Fairness in Handicapping Committee of the Gentlepersons’ World Tour (FIHCOT), he was the best target. Bas booked us in for the back 9 at North West Bay this afternoon, where unfortunately it rained on and off. The greens were fairly well soaked, but at least there was minimal wind. With the MP index and respective handicaps, this was a fairly good course for Tim – getting extra 2 strokes on both of the par 3s! The 1 stroke holes were a par 5, and two of the big par 4s. This match was open for the taking. Approaching the clubhouse together, Basil’s buggy got stuck in a ditch and his bag fell to the ground. Even with that omen, he chose to continue with the match. Hole 1 – par 3 – 2 strokes handicap. Big drive needed over a ditch to start things off. Basil teed an iron straight onto the green, and with a good long set up putt, he par’d, solid start. Tim’s hybrid fell short of the green but a rare good short iron got on and also 2-putted, for a bogey. Hole to Tim (T1-B0). Hole 2 – par 4 – 2 strokes handicap. The wide fairway on this long downhill was very forgiving, but after a decent drive Tim couldn’t aim or judge distance on the approach irons and ended up with a 7. Basil crunched his drive down the middle, then ironed a bit short, and his 3rd shot was a great chip on to the very wet green. This set up a big 6m putt for par. Hole to Bas (T1-B1). Hole 3 – par 4 – 2 strokes handicap. This is normally a long fairway (nearly 400m), but due to some damage the tee area was temporarily set up about 40m closer. Controversial! Both players drove well, but took two more shots to get on the green. We also both took 3 putts to finish, struggling with some fairly challenging green conditions, some holes being a lot more affected by the water than others. 6 strokes each, hole to Tim (T2-B1). Hole 4 – par 4 – 1 stroke handicap. Big uphill with only 1 stroke, this was one of Bas’s best opportunities. Basil’s drive went up the hill to the right, ending in rough. He got a lot of distance next, but into a bunker. On the green for 3, but a long way from the pin. His big putt wasn’t close enough to sink the next, needing a 3rd. Tim stayed on the fairway, not hitting as far as Bas but getting clean shots on approach. On the green in 3 and also needing 3 putts, 6 strokes each was unexpected but another hole for Tim (T3-B1). Hole 5 – par 3 – 2 strokes handicap. Both players approached this hole knowing it was the easiest of the round for Tim to win – an easy par 3 with 2 strokes headstart! Bas fell short of the green but chipped well, sinking a 3-4m putt for par. Tim fell short but with a bad lie, taking two more chips to get on and with too far for a single putt, this was the one that got away – double bogey. A draw (T3-B1). Hole 6 – par 5 – 1 stroke handicap. Biiiiig par 5, with the fairway turning twice. Basil crunched his drive up the fairway. Bas then thought this would be a good time to mention that it would be an easy hole for me to drive short of the women’s tees (with the big pond right there). Mind games, and it worked. Tim topped the ball off into scrub down the hill, and took multiple shots to recover onto the fairway. There was no coming back, even with decent fairway shots (loving the hybrid). Tim was on in 8 and 3-putted for 11. Basil missed the fairway on approach, but after watching all my bush bashing knew he could take it easy. On in 5, easy two-putt for 7. Hole to Bas (T3-B2). Hole 7 – par 4 – 2 strokes handicap. Tim wanted to quickly move on from that nightmare and recovered well here by avoiding all the trees and driving straight down the fairway. Bas went through a tree to the right of the fairway but still got plenty of distance and a good lie. Tim mis-hit an approach shot but recovered – on the green in 4, and 2-putts. The soggy greens struck poor Bas again here and he also scored 6. Hole to Tim (T4-B2). Hole 8 – par 4 – 1 stroke handicap. Clutch time for Bas, needing to win the last two holes to draw the match. His drive pounded straight into the dirt 20m in front of the tees, but somehow bounced as far as Tim’s ordinary fairway drive. At 135m out and with not a good view of the green Tim produced his shot of the day, gently but cleanly pushing a 6 iron over the ridge and rolling to the edge of the green. Basil had a bad lie after the muffed drive, and his approach bounced left into the bush. A penalty drop, and a chip going well over the green, and he couldn’t beat Tim’s 3-putt bogey. Bas forfeited as the hole to Tim (T5-B2) sealed this deal. Hole 9 – par 5 – 2 strokes handicap. Though only played for fun, we both kept to the fairway on this big uphill par 5. Bas’s par and Tim’s bogey would have been another hole to the dark side. Sorry that it came at such a heavy emotional cost to Bas, who regretted not enforcing the clothing forfeit (I wasn’t wearing a collared shirt! ), but I was happy with this introduction to the Tour even if it cost me another penalty beer for a muffed tee shot. Tim and Leroy saddled up for a bit of a match yesterday in calm weather, with just a few drops of rain near the end of the match. We played the back 9 holes, Tim got 2 shots per hole and Leroy only 6 shots for the 9 (didn’t get the 1st, 5th and last). Tim’s tee shot went straight into the long grass in front of the tee (not making the ladies tee) and he had 2 more to be just near the green. He chipped over the green and then had 3 putts for a 6. Leroy chipped onto the green for 2 and made an 8 footer putt for par. Leroy 1 up. Tim went left of the tee but with some good recovery shots made the green in 4 and 3 putted for 7. Leroy had an adventure with the trees right then left to scramble a 6 to square the hole, all square. Leroy 1 up. Both drives went long and a bit left, Tim made the green in 3 and 2 putted for Bogey (well done), Leroy’s second shot was a low worm burner under the trees and somehow made the green to be 30 feet from the hole, and then made the long putt for a cheeky birdie. Leroy 2 up. Both drives long and on the fairway, Tim had 2 shots to be just short of the green, he chipped on to be 10 feet from the hole and BOOM – drained the put for bogey. Leroy made bogey after missing a shortish putt for par. Tim wins the hole. Leroy 1 up. Both tee shots near the green, Tim left, Leroy right, Tim chipped over the green and then back on for 3 and 2 putts, Leroy chips on and is about 20 feet from the hole and again drained a long one for par, all square. Leroy 1 up. Tim’s drive went into the trees right and he had an awkward shot, which he smoked, to end up well down the neighbouring fairway. Tim said “that went a bit further than I expected to hit it”. This extra distance left him in a spot which blocked his line to the green and became the start of an adventure through the trees for Tim resulting in a few extra shots to make the green for 7 and then a few putts. Leroy made a steady bogey. Leroy 2 up. Leroy’s drive down the middle but shortish, he then sliced an iron around the corner trees to be just short of the green. Tim’s drive went into the trees left, where he had a few shots to get out. This included an absolutely awful lie, where Tim had to hit the ball through a bush below his feet. There may have been an air swing or 2. Tim made it to just short of the green for 7 and then finished tidily with a chip and 2 putts. Leroy messed his chip onto the green, had another chip onto the green and then 2 putts for 6 to take the hole. Leroy 3 up. Tim’s drive up the middle, second shot up the middle, third shot up the middle and just short of the green under the hill. Tim chipped on nicely to be about 12 foot from the hole and drained the putt to make PAR. Cravo, Tim, Leroy and Ian met at icy Tasmania GC for some MM on Sunday. Cravo rocked up with 4 hours sleep in the bank, intending to cancel his MMs due to fatigue, but Tim talked him into playing. Tim very gallant taking us on at such a tough course, and also doing it in tee shirt and shorts when everyone else was in layers of polar fleece and beanies! Cravo drive slapped down by the waratah bush at about 150m, Tim bounced one up the path. Cravo tried a cut 5 iron, but got no cut and ended up in a grass tuft trapped by gum trees. On for 5. Tim just through the back for 3. First chip stayed up. Second chip stayed up. Third chip was beautiful touch and finished about 15cm from the hole. Cravo’s putt didn’t fall, so Tim had his tap in for a win. Missed it, and missed the one back, giving Cravo the hole and the win 4&3. Tim would’ve won the 7th, but nice Cravo 6 iron and easy par on 8th won that, and both were ordinary on the 9th. Playing the game it felt like Cravo should’ve been giving Tim 2 shots on another 4 or 5 holes, so something more like a 45-50 handicap would’ve been spot on for Tim on this course and how he was playing. Although -Tim stepped it up on the back nine. *Note to FIHCOT – Tim has 4 games in the bag for this MM so suggest we leave as is, and up the handicap for the Bougle. One of the many big par 4s, at least this one is straight though. I sliced the drive right up the hill behind a bush. Have to apologise here, apart from knowing Ian crunched every drive I didn’t keep good track of his play as I really just spent the day looking for my balls in the rough and trying not to worry about holding the others back. Recovering from right-hand rough to left-hand rough with a series of mis-hits set me on track for a bad start – 8 strokes to Ian’s 6. Ian 1 up. Steep downhill par 3 with threats on all sides. Ian landed just on the right-hand edge of the wide green, with the pin way on the left. Tim pulled into a bunker left of the green, and recovered out of the sand a long way from the pin. 3 putts each, so with 2 strokes it was a hole to Tim (quote Ian “how do I lose with a bogey!?”). All Square. Long par 5 with a dogleg right. As with most of this course, there was a lot of fairway to hit but if you didn’t go straight you’d be in some unforgiving rough. Tim hit a clean drive and went straight down the fairway. Ian really got onto this but sliced right, hard to tell if we’d be able to find the ball so he played a safety. This also went right, but he ended up finding the 1st drive. Ian’s second shot got some distance but stayed in the rough. Tim stayed straight and safe, ending with a bogey to Ian’s double. Hole to Tim, Tim 1 up. Longish par 4, going uphill and left. Felix had joined us half-way through the last hole to inject some banter and keep us grounded, I blame him for the poor drive. This was my worst hole of the back 9, with a lost ball and many shots in/out of rough. 11 strokes to Ian’s 5. All Square. Par 5, slight dogleg right. Tim topped the drive and rolled 50m up onto the edge of the fairway left of ours. Ian’s drive went up and way left, straight towards a 12yo on the 10th fairway. He sure moved though when he heard ‘fore’, the ball landing only metres from where he’d been standing. Ian didn’t have a good view of the green from up there, but got great distance and kept his ball low and straight towards the pin, he ended with a bogey. Tim stayed pretty straight but struggled on the green, again, for a double-bogey. Hole to Tim, Tim 1 up. Shortish par 4, but uphill and left with some dangerous bunkers around the green. Though I recall again muffing my drive and struggling to locate the ball, my lasting memory of this hole was the discussion of our handicaps. Turns out we had gotten it the wrong way around – I should have gotten 2 on the 1st hole and only 1 stroke on all the others. My gut sank, and I’m sure Ian’s heart rose in his chest! Looking at our actual scores thus far though, it wasn’t as bad as I thought, with us All Square to this point. I double-bogied this hole and Ian got a bogey. All Square. Looking down at a long, straight, narrow fairway, the memories of all my muffed drives scared me into a hybrid on this hole, which I promptly pulled left into scrub at the bottom of the hill. A safety went into the same spot. Ian crunched his drive, I don’t recall what else happened on this hole but I recovered well enough with a big hybrid, Tim +3 to Ian’s +2, another wash. All Square. Par 4 uphill to the left. I drove first, wanting to put some pressure on Ian. If I won this hole he’d be really up against it to save the match. My drive was good, one of the few I kept on the fairway. Ian’s went long but so far right, there was talk of an out of bounds area, drops, penalties. After a couple of ugly safeties, it was lucky he located the first drive which must have hit a tree as it was back out onto the edge of the fairway, with a straight line to the green! Tim’s fairway shot banked left into some trees which took a couple of shots to get out of, and the approach iron dropped into a bunker short of the green. I was there for 4, with Ian in that same bunker for 2. We got out ok, but I didn’t recover on the green, Ian’s bogey beating my triple. Ian 1 up. Bit of uphill on this par 3 caught us all unaware, Tim falling short of the green and Ian slicing right of it into rough. I chipped far up onto the top of the green, with a big downhill slope. Ian took two chips to get onto the green, and two-putted for 5. Tim’s long downhill putt rolled way past the hole, and the next uphill putt fell far short. With another medium sized uphill putt (2m?) needed to win the hole, Tim rose to the occassion just this once, and sank it. All Square. It was a good match, not sure how it would have gone mentally if we had the right handicaps from the start but it sure felt like daylight robbery for Ian not to walk away with a win. Keen for Ian to correct me on his play here, or add to it with anything he remembers. I’ve got too much on my mind while playing to even keep track of my own ball, let alone the opponent’s! And yes, this has happened once every round I’ve played in the MM. Notably, hasn’t happened any of the times I’ve played by myself! Leroy went right off the tee and second shot onto the neighbouring fairway, then near the green for 3 and 3 putts for a double bogey. Cravo had a bit more style off the tee and made the green side bunker for 2. 2 bunker shots and 3 putts for a triple. All square. Both pretty good off the tee, Cravo a bit better. Leroy had a tree in the way. Cravo hits onto the green in reg. Leroy hits a slice from 140m around the tree and gets a lucky bounce to be on the green. Cravo 3 putts for bogey and Leroy 2 putts for par. Leroy 1 up. A classic battle that went to the last hole. Ian’s par on the 8th put him 1up and then he finished off in style with a long putt for bogey to win the 9th as well, for a 2up win. The great flood of 2018! 3 of our usual holes had been converted to par 3s so Leroy had a great idea switching 5th and 6th instead of the 11th & 12th. Leroy’s drive hits the tree and plonks in the middle of the fairway but a long way back. Felix finds the trees right. Leroys 3rd from 100m out also hits leave and unluckily drops straight down. Felix arsy, on the green for 2 shots from a punch out. Leroy’s 3rd goes into the bottom bunker. Felix’s 3rd goes into the right bunker. Bunkers are GUR due to the floods. Both chip on for 4. Basil tee shot just left of the green after a tough bounce sent it left. Leroy, well short of the green after a scratchy start. Leroy chips on the green with next shot. Basil chips short of the green and then chips on and the slope of the green catches the ball and it runs. Both 2 putt – Leroy 1 up. Basils tee shot lands on the green and then back spins off. Leroy hits a flat one past the green. Both chip on and 2 putt. Leroy 2 up. Leroy slices tee shot into trees but gets a lucky bounce and finds the ball. Basils tee shot draws into the trees leaving an awkward lie under a tree. Both hit short of the green. Leroy on with a bounce and it rolls to near the pin. Bas chips on and gets a rough bounce going away from the green. Bas drains a long bomb for par and Leroy taps in for par. Leroy 3 up. Bas goes into the trees right, Leroy straight down the middle. Bas hits around the trees to be short of the green. Leroy hits into the trees right and gets the Basil A grade kick to be just short of the green. Both chip on and 2 putt. Leroy 3 up. Basil slices into the trees, gets a lucky bounce and the ball comes back into play. Leroy finds the fairway. Bas makes the green in reg to make par. Leroy duffs a couple of shots to make a double bogey. Leroy 3 up. Basil smokes his tee shot, slices it round the corner, to be next to the green, chips on and makes a birdie. Leroy ends up under the trees and has to play right handed to get out, has a few more shots to give Bas the hole. Leroy 2 up. Can Bas tie the match? Bas hits a high tee shot to find the fairway. Leroy gets a slice into the trees left. Bas hits a 3 wood to be right of the green. Leroy squeezes under the tree (holding a branch with his head) and hits a low punch under another tree to find the fairway. Leroy chips on and so does Bas, but Bas’s chip catches the slopes and runs a bit. Leroy 2 putts for bogey. Bas’s second putt lips out and he taps in for double bogey. Leroy takes the hole and the match 3 and 1. Would it translate to a Saturday towelling up of the three time MM Champ? NAH, of course not. As if! Both Gents have losing records at Llanherne, so they figured it was the perfect place to do battle! Cravo and Felix very pumped and very nervous, were in for a slow match, having to follow the last Saturday comp group around, which was 100% old farts. Would the battle be done before darkness fell? Stick battle for the first 8 holes with Felix getting a shot on the 9th. Off the back markers. Felix gives Cravo a lolly to help him out. Thanks mate! Two more amazing drives – Cravo fairway middle 145m to go, Felix fairway left 80m to go. Cravo decides the best thing to do is hit a soft seven iron, which he executes perfectly for a GIR. Felix hits a fat pitch, then skinnies his next one but not that far off holing it and finishes about 6m away. Cravo hits a really nice birdie try up and over the hill and it rolls 6ft past. Felix goes for his par but misses. Cravo actually has this putt to win the match but lips it out. Bogeys for a tied hole. Cravo dormie : 3 up with 3 to play. Felix goes with iron and wants a high draw but gets a snap hook, leaving him on sand 180m out. Cravo’s back foot slips but he hits it fairway middle 140m to go. Felix’s 2nd is not clean, running down to about 70m out. Cravo goes another soft 7 iron, fats it, but watches it bounce and run pin high off the left. Felix on for 3 shots is away. Can’t make his downtown par, so Cravo has 3 shots to win the match. His Cravo wedge is a touch strong, running to about 3m. But he makes that for par and a 3&1 win vs the three time MM Champ. Last hole easy pars for both, which would’ve been a win to Felix, so lucky Cravo got it done on the 8th! Due to match play index, Ian didn’t get any HC benefits !!! In 8 holes Ian hit the ball 37 times, however Felix hit the ball 31 times and won the match 3 & 1 ! Ian was no match for one putt Kennedy (no matter where he was on the green!) with Felix finishing the front +2 off the stick !!! Following straight on from Felix’s great form on the front 9 at Tea Tree, he made the mistake of taking on a warmed up and fresh Tim on the back 9. In Tim’s favour were the conditions (gusty wind ignored my low stingers and punished Felix’s unnaturally high balls) and the support of a local member who had joined Felix & Ian for the stroke comp (he took a shine to my good looks and fashion on the field, and helped me out with some kind words and an accidental stray foot to stop a ball rolling off the green). In Felix’s favour were the MP index (only 2 strokes on the first hole, and only 1 stroke on the rest), his godlike putting, and his inability to miss the fairway. After a mis-hit iron, Tim won the first hole (difficult par 3 if you miss the green) with a decent recovery wedge and solid two putt for bogey, beating Felix’s monster one-putt from the fringe for par. Felix knew he’d made a mistake taking me on and tried to weasel out of our match! No way, a gentleman never backs down. Alas, the next eight holes can be summarised as Felix driving well and putting like a pro, and Tim losing a half dozen balls in the assorted brush, woodlands, and even water around the course. We drew one other hole (another par 3), but otherwise Felix smashed me all over the course and took it 4 up with 2 to go. note : all fences are electrified! Drizzly wet conditions and cold, even Tim put on a jumper for the first few holes. Felix hits a low ground grubber just off fairway to the left. Bas goes up the guts. 2nd Hole Par 3 Felix 1 shot. Sucker pin position was 1 metre from edge of green and steep downslope. Bas hit a 7 iron to front middle of green. Felix pulled tee shot a little left below a steep bank then produced a superb high chip and stopped it 4m from hole. Bas left his uphill putt way short. Felix two putted for bogey. Bas drained his 2.5m putt to halve the hole. 3rd Hole Par 4 Felix 1 shot. Bas hit a fade off tee which found another fairway then a wedge to middle of green. Felix just clipped a tree off his drive then hit a great iron in that flew too well and bounced over the green. He chipped back on and two putted. Bas two putted and another squared hole. Bas went up the fairway left then hit his approach skinny which bounced through the green and ten metres up the hill leaving a treacherous downhill chip which he hit too hard back to front of green. Gave his par putt a good chance but it just missed the left edge- bogey. Felix cranked his drive a long way right after aiming up for a draw he hit a slice but no harm done on another fairway. he hit a great high approach that caught bank behind green and trickled back onto the edge of green close to a back pin. He drained the 3m birdie putt to win the hole. All square. Felix hits his drive a little left and it catches a few tree branches and lands in the rough. He then hits a great approach to front of green. Bas hits a good 3 wood drive up the guts just clearing the tree. He closes the face on a 52 wedge and it bounces 10m left of the green. Bas hits a high 56 wedge to 1m and gets his par. Felix leaves his first putt a little short and grazes the edge of the cup with his next- a bogey it is and a squared hole. 7th Hole Par 4 Felix 1 shot. Felix hits his tee shot into the trees left but then hits a great recovery but still 30m left of green. Bas hits a good drive but it just feeds into light rough on the right. Bas hits it fat short of green then chips on for 3. Felix hits on for 3 and two putts. Bas 3 putts. Felix wins hole. All Square. Bas hits a 5 iron 10m left of green then chips onto the edge of green. Felix hits his 5 iron way right but then chips a bit short then another to 3 feet. Bas putts but it races past the hole and finishes a bit over 3 feet. Bas nails his putt for 4, Felix just misses low side. Bas 1 up. Felix cuts his drive into trees to the right, Bas finds the fairway and then two more shots onto the green. Just misses par putt and has to settle for a bogey. #I forgot to mention TIM J hit the shot of the day on the 7th hole with a half wedge from 50m out, to a foot from the hole to get a bogey. …..pulls his approach and onto green for 4 shots with medium length putt which he likes the look of. Two putt double bogey and Bas has won his first match 2 up. Thanks for a good match Felix, once you get your radar back on with the driver you will be unstoppable. Conditions: Fine and clear with barely a breath of wind. A bit dewy on the course, but still plenty of run with firm greens. Ian H/C: 17 Bas: 6- Ian gets an extra shot on 5 holes. #Bas gives Ian a shot for the hole. Bas opens with a drive down the left side that just trickles onto the sandy rough. Ian hits it a bit right off his drive and finds the fairway next door about 130m out. Then hits his next a little right of the green and chips on for 3. Bas hits a three quarter wedge to front of green to leave a long putt. bas two putts for a par, Ian gives his a chance but it misses the hole. Bas 1 up. Bas hits a 7 iron onto the front of the green, pin is at the back. Ian connects well but it just glides a touch to the left and is found underneath the Boobayalla wattle. Ian takes a penalty drop onto a sandy lie but then hits a reasonable shot to middle of the green. Bas lines up his putt and gives it a good roll to finish within 10cm of the hole and a tap in par. Ian goes for his bogey from mid range and slides it by to miss halving the hole. Bas 2 up. #3rd Hole Par 4 Bas goes up the guts with a solid drive, Ian hits a solid slice but it is still on the fairway about 15m behind Bas. Ian hits hits iron a bit short and right of the green and Bas also goes right of the green with his approach shot. Both chip a little short and 2 putt. Ian fights back and wins the hole, Bas back to 1 up. Ian hits his tee shot a little right and it hangs up in the light rough above the bunkers. Bas hits an 8 iron to within 4m of the pin. Ian hits a brilliant high wedge that trickles down the slope between the bunkers and finishes about 3m from the hole. Bas lines up his birdie chance but misses on the top side overthinking the amount of burrow on the putt or was it the dew that stopped it from turning, anyway tap in par. Ian for a good chance to square the hole just misses on the low side and Bas is back to 2 up. Ian cracks his drive with a bit of a slice and puts it neatly on the adjoining fairway, then hits a hybrid a little right into the wattles but manages to extricate himself out of trouble back into play on the otherside of the fairway and chip on for 4. Bas hits a smoking drive up the guts then everything begins to unravel with two topped shots in a row dribbling down the fairway. He manages to punch a low 9 iron onto the green for 4. Ian takes out his putter lines up and makes a perfect strike from 8m, straight into the centre of the cup. Par for Ian and a win for the hole.Bas is mumbling to himself about keeping his bloody head down as he two putts for bogey. Bas 1 up. Ian steps up to the mark with a swagger in his step and cranks the longest drive (245m) of the day down the ‘A’ line right side of the fairway. Bas also hits a solid drive but a few steps behind Ian. Bas hits a solid 8 iron straight at the flag but it doesn’t grab the green quickly and runs out about 6m past the hole. Ian hits a little short and right below the green. He uses his putter to knock it on but gets it a little strong and it rolls through then on and 2 putt 6. Bas safely 2 putts for par and it is back to 2 up. Bas and Ian both hit good shots down the fairway, Ian then lands onto the front of the green and bas hits the back of the green for 2. Ian hits his first putt a little short then next one just past and goes for a knock in 5 but it catches the lip and comes out. In for 6. Bas glides his first putt a little long past the cup but gets his par coming back. Bas wins the hole and the match 3 & 2. Thanks for a great match Ian- with a couple more putts in, it would have gone down to the wire. Signing out for MM 2018. Last MM game for me but super excited about watching some of the final playoffs. Felix, Tim and Leroy visited NW Bay yesterday for a MM play off round. Conditions were a little unusual, in that the greens were cored and sanded and the holes were twice as big as normal. We decided to press on the basis that it was a level playing field. We had a couple of warm up holes and then got stuck in on the 3rd. On handicap Felix got an extra shot on the 5th hole of the match. Both players carded a bogey with 2 putts on the green. All square. Felix bombed a drive into the trees right, but made good with the second shot to be just off the green, the chip ran over the green, then chip on and 1 putt bogey. Leroy carded a bogey after narrowly missing his par putt. All square. Felix bombed another drive left onto the other fairway, chipped to near the green, chipped on close to the hole and 1 putt par. Leroy had a couple of duff shots to card a bogey. Felix 1 UP. Leroy finds the bunker (on the 6th) off the tee and scratches around like a chook in the yard to eventually card a double bogey, giving Felix an easy hole to win with a bogey. Felix 3 UP. Tim smoked his tee shot to be 3 feet from the hole and looked like going in, but not quite….. Both players made good shots to make the green in reg, Felix played a great 2nd shot from under the trees to end up well down the fairway, Leroy actually started hitting the ball properly for the first time that day. Leroy 1 putt birdie and Felix 2 putt par. Felix 2 UP. Felix shanks his tee shot and instinctively says “DAMN” and then the ball rolls into the dam. Felix hits over the green and then chips on for 4. Leroy plays steady to make par. Felix 1 UP with to go. Leroy nice tee shot to be just in front of the green, while Felix went left into the trees. Felix makes a bogey and Leroy par. All square, 1 to go…………. Felix goes big and long, and second shot lands on the green 10 feet from the hole, his first putt is tracking for the hole and stops just short of the hole…….bummer. Leroy takes 3 shots to get on the green, but is closer to the hole and drains the putt for par to square the hole. After 9 holes we have a DRAW. We decided to play a play-off play-off hole to sudden death to find a winner, just in case Cravo gets himself into the final automatically, thus making this match the only MM final playoff match. Felix goes long off the tee and left on the other fairway. Leroy steady and down the guts. Felix second shot is short of the green left, his chip on leaves a 30 footer. Leroy pulls out the 3 wood for the second shot and nailed it to be just short of the green and chips on to be close to the hole (5ft). Felix 2 putts and Leroy 1 putt. Leroy wins the play-off play-off – if it is needed as a result of another MM match to come. Tim made 18 stableford points on the front 9 and looked on track to play to his handicap for the rest of the round, but I had to run away…how did it go? Yesterday, Pittwater, 1PM was the location of the last roster MM match of 2018. The close MM series mean that of the three possible results all would have changed the finals landscape ! Ian playing off 17, Cravo 15 or 16 – end result was Ian gets a shot on the 9th. Cravo steps up and smokes one down the fairway, and I mean smoke it. So much so that Tim has just declared Cravo the winner of the match without Ian even taking a shot. Ian of course wants Tim to eat his words however only manages a drive 50m short of Cravos and in the trees to the right! Cravo mis-hits his second with it only travelling 10m down the fairway, with Ian knocking his town towards the green. With a couple chips and putts the hole is split 5 a piece, all square. Cravo smokes another drive, with Ians not to bad but a little more left and in the rough. Ians second was a little fat with Cravo trending down the left hand side of the fairway. Ians 3rd goes pin high but under a smallish tree, Cravos 3rd comes up just short (or right? my memory is hazy!) Ians chip manages to roll to about 3 foot short of the pin with Cravo a couple meters away. Ian sinks his putt with Cravos heading just past the hole leaving the scores of 5-6 and Ian goes +4, with 4 to go. Both with half decent tee shots however Cravo heads slightly left with Ian heading right. Both with solid approach shots ending pin high on the right fringe. Both with good putts from the fringe Ian tracking past the hole and cravo just short. Both draining their par putts to tie the hole. Ian takes the match 3 & 2. MM playoff Felix v Cravo – extremely windy Pittwater. After getting blitzed by Ian, Cravo asked Felix if he was up for their playoff. And then Cravo proceeded to change his mind about 5 or 6 times before confirming that he himself was up for it. Good drives from both, Felix unlucky in the trees. Cravo just off the back of the par 5 for 3 shots, Felix up top for 4. Cravo thinking a 3 putt will halve the hole plays accordingly, but has forgotten Felix gets a shot. Both players get bogey which means Felix wins this hole. AS Drawn match. Decided not to play a playoff hole as it had been too intense and not fun. Cravo needs to sort himself out and get his head and heart back in order. Sheesh! And thanks to Felix for being such a great fellow. Felix will be into his fifth MM Final in a row if there is a result in the Leigh battle. If that match is also a draw then we have to resume the playoff holes (with Leroy having won one of those). Felix calls a handicap adjustment on himself a few days later, as he was actually playing off 15, which means that the last hole was halved and Cravo squeaked a narrow 1up win to progress to the Final. Superb sportsmanship by Felix as we would expect from this Top Gent. Only missed his 5th final in a row by the narrowest of margins, despite him calling it by far his worst MM campaign in recent memory. Sheesh! Lookout next year! Posted on September 19, 2018 September 21, 2018 by Gentlepersons' World Golf Tour, Tasmania	This entry was posted in golf, Uncategorized and tagged #auroracurse, #felixgolf, #matchplaymasters, #MM, matchplay. Bookmark the permalink.